Yoga is a group of activities carried out to accomplish physical, mental and spiritual goals. Yoga is of many kinds but Power yoga poses are known as great ways to lose weight fast and get fit. It was basically practiced by ancient Hindus and Buddhists. In simple yoga; a pose or positions i.e. asana are maintained by sitting at the same place. Power yoga is a modernized version of yoga developed especially for western lifestyle. Power yoga is a form of Vinyasa style of yoga. It is done with great speed to obtain the desired body physique. You can achieve weight loss at home by the means of easy to do power yoga poses. Power yoga poses emphasize on strength and flexibility of the body. In power yoga you are free to follow your own styles. Power yoga is very beneficial for your body as it helps build internal heat and boost your stamina. Power yoga poses also help in strengthening your body and increase your flexibility. It can also be used as a weight loss at home exercise as well as stress reduction technique. Power yoga poses also helps in controlling diseases like Parkinson’s. About The Pose: Surya Namaskar or sun salutation is the basic yoga pose to start your daily routine with. This helps your body to warm up naturally and it strengthens your heart muscles too. It should be practiced as a morning ritual to start your day energized. It also helps to purify inner body. Benefits: Research has shown that one round of surya manaskar can burn upto 13.79 calories. If you perform the complete 12 sets you can easily get weight loss at home even without following any tough diet routine. These power yoga poses not only energizes your body but also helps to burn extra fat. About The Pose: Basic squats or malsana (garland pose) are one of the best power yoga poses to start your day. It is a set of basic squats which you can easily perform by sitting on the floor and opening your thighs wide. Benefits: It is best to tone up your thigh muscles and belly. It also helps to make your bums look good; it’s one of the easiest power yoga poses to begin with and helps to get weight loss at home. About The Pose: Urdhva Mukha Svanasana or the upward facing dog pose is one of the best power yoga poses to tone up your upper body parts; arms, biceps and triceps. This asana/pose involves stretching your arm muscles and balancing your body weight. Benefits: It helps to stretch back thus gives stress relief, improving your body posture and increases your stamina and improves digestion. About The Pose: Nauli or abdominal churning is an excellent way for you to burn extra fats around the hips and tone up your belly. It consists of rotating the central part of your abdomen while holding your breath on empty lungs. 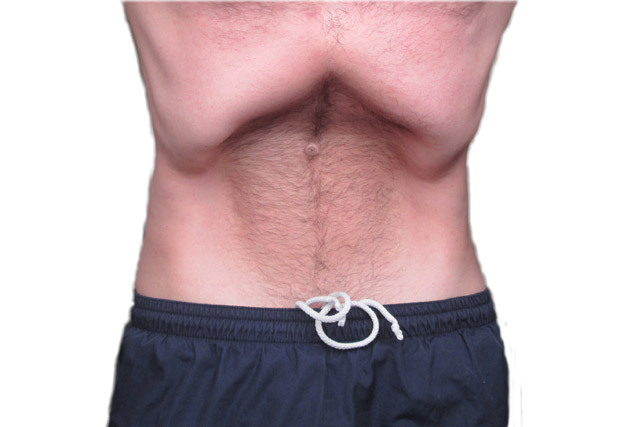 Nauli allows you to keep your abdominal region in shape. Benefits: It fires up your digestive system and you can digest anything if you regularly practice this asana. This power yoga technique helps you to tone up abdominal muscles. It helps in toning up your lower body. About The Pose: Ardha Pincha Mayurasana or the Dolphin pose is in the shape of an inverted V in which your forearms and toes are on the floor while the rest of the body is in the form of an inverted V. it is a very good power yoga asana and by doing it regularly you can easily get weight loss at home. Benefits: It strengthens your calves, hamstrings and shoulders also gives strength to your bones and keeps you safe from osteoporosis and helps in relieving menstrual cramps. About The Pose: Paripurna Navasana or the boat pose is the perfect power yoga pose if your prime goal is to get rid of that stubborn belly fat. This pose is just like a see-saw; your midriff becomes the base of your body balance. It helps in toning up your abs. Benefits: It helps you to lose your belly fat by providing suitable stretching which helps in burning belly fats also helps you in maintaining a slim waist; it is highly useful for getting weight loss at home and facilitates in building six pack abs. About The Pose: Raja kapotasana or the king pigeon pose is an intense workout for your entire body. This power yoga asana helps you to tone up your complete body. It improves the strength and flexibility of your body. It is an advanced level technique. Benefits: It is best posture for hip flexures, strengthens your back and lower limbs also helps in stress and improves your urinary and reproductive systems.